One of the nation’s fastest growing quick casual dining concepts, Costa Vida has more than 43 locations countrywide. 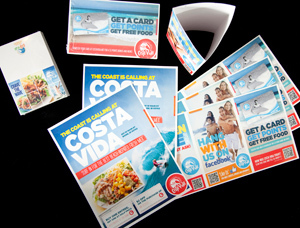 Costa Vida needed a way for franchisees to be able to quickly and efficiently order marketing materials. Without a lot of effort on Costa Vida’s part or their franchisees, a process needed to be set up so that everything could be branded and shipped out quickly. They are then able to get their materials printed and shipped directly to them. For the franchisor there will be less headache, fewer mistakes, bigger bottom line, and real-time tracking results.